Orla Corr OBE, Executive Chairperson and shareholder of the McAvoy Group, will be the guest speaker at the next Up for Business event in Dungannon on June 1 at 8am. 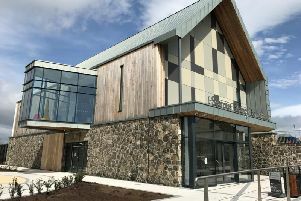 A Coalisland businesswoman, awarded an OBE for services to the construction industry, will be the key speaker at the next Up for Business networking event in Dungannon next Wednesday, 1 June, at 8am. Orla Corr OBE is Executive Chairperson and shareholder of the McAvoy Group and a champion for women in the construction industry, and has seen her company grow over this past few years. She will speak about how the McAvoy Group weaved their way out of one of the deepest recessions of modern times with growth in employee numbers and a bulging order book. Orla joined McAvoy as Financial Director and was appointed MD five years later. Stepping down from this role in late 2007, Orla chose to concentrate on her real passion of business development and marketing. In 2008 she became the first woman to be introduced into the Entrepreneurial Hall of Fame in recognition of her business achievements within the McAvoy Group. She is a past winner of the Women in Business NI award for Entrepreneurship/Innovation and the Outstanding Business Woman of the Year. She holds the distinction of becoming the first Entrepreneur in Residence in the new Leadership Institute at Queen’s University Belfast’s Management School. Outside the McAvoy Group Orla is a Director at The Odyssey Trust Company which runs the highly successful SSE Arena. She received an OBE in 2011 for services to the construction industry. Up for Business provides Dungannon businesses with networking, mutual support and the benefit of free advice from experts in many different industries. The June event will be the last for the summer and it will resume again in September being held on the first Wednesday of the month from 8am-10am.